A rainy day. I headed to the cafe, meaning to hole up with a pot of tea, a toasted sandwich and a book for the whole lunch hour. The book I grabbed from the pile of review copies was The Me, Without by Jacqueline Raposo. Raposo was a “middling successful” New York food writer and podcast host. She had creative work she loved, her own apartment, supportive family, and a beautiful dog. But in 2016, she was also single, struggling with chronic illness and broke. 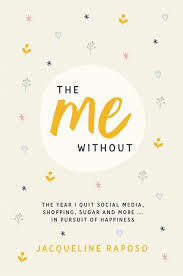 The Me, Without (due for release in January 2019) is her record of an experiment, over the course of a year, in which she removed things from her life – for set periods – to see if she could become happier. Her ‘challenges’ were no social media: no shopping: no sugar: no holiday gifting: no negative thought: no waste: no hustle: and no habit. It’s a mixture of memoir, psychology, neurology, history and literature. As soon as I started reading, I decided I was going to hate this book. I pre-judged Raposo as a whiny, entitled, neurotic New Yorker. And really, does the world need any more self-help books? But actually, once I got over my prejudice, I really enjoyed it. She’s engaging and funny and brutally honest about herself. She caught Lyme disease as a 12-year-old, and the toll on her health has been heartbreaking but she doesn’t paint herself as a victim. It is what it is. The Me, Without has made me think about the time I lose doing things from habit. I like to think I’m pretty frugal and sensible and green, but when I think about it, there’s lots of stuff I consume unthinkingly. I could do so much better! I now have some very expensive cloth-and-beeswax substitutes for cling-wrap and a mission to reduce not just our rubbish, but our recycling as much as I can. Moreover, I have set myself my own little set of challenges. I feel I should apologise, because the first one is not very…well, not very challenging, actually. It’s this: until Christmas, I’m not going to switch the TV on and watch random shows or surf channels any more. If I want to watch TV, I will look up the TV guide and choose something. Or not. And mostly, it’s been not. Instead, I’ve been reading. Who would have thought?